Determining the Half Value Layer (HVL) of the x-ray beam is the standard method for specifying the quality of the x-ray beam. For a given kVp, a measurement of the HVL gives information on the total filtration in the x-ray beam. Too little filtration results in unnecessary radiation to the patient and too high of a HVL may require increased kVp and mAs, increasing tube loading and reducing tube life. 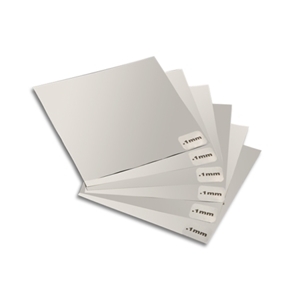 Gammex 115A Half Value Layer Attenuator Set contains nine sheets of 1100 AluminumAlloy ranging in thicknesses from 0.1 to 2.0 mm. For your convenience these sheets come in a plastic storage case to help maintain flatness and for ease of storage and transportation.